J&V Carpentry is Bespoke Furniture Company based in UK made up of decorators and experienced carpenters in the year 2007. 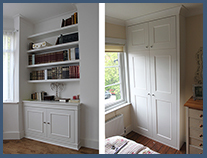 The company has extensive experience building a wide array of fitted furniture and we can work across the entire London area (North, South, West, East and Central London) to build our bespoke carpentry items such as fitted wardrobes, cupboards, bookcases and fitted bedroom furniture. Our company can provide a selection of friendly and fast services in every aspect of custom furniture made out of hand painted MDF. We have long served the London area within the M25 range and our company continues to expand to suit the needs of our clients. We build a wide range of fitted furniture out of MDF. By sourcing only the best quality materials and employing a team of some of the most experienced furniture makers we can deliver the best in bespoke furniture built for your custom needs. 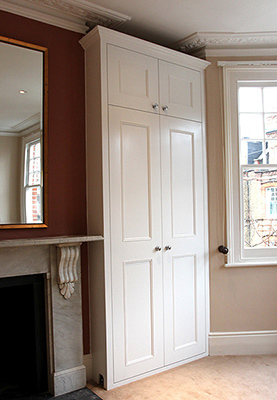 Alcoves in period properties created by an original fireplace and chimney breast in the centre of the wall. Typically, these recesses are perfect place for built-in shelving in livingrooms and fitted wardrobes in bedrooms. JV Carpentry has been established in 2007 and it was only one carpenter and his helper back then. 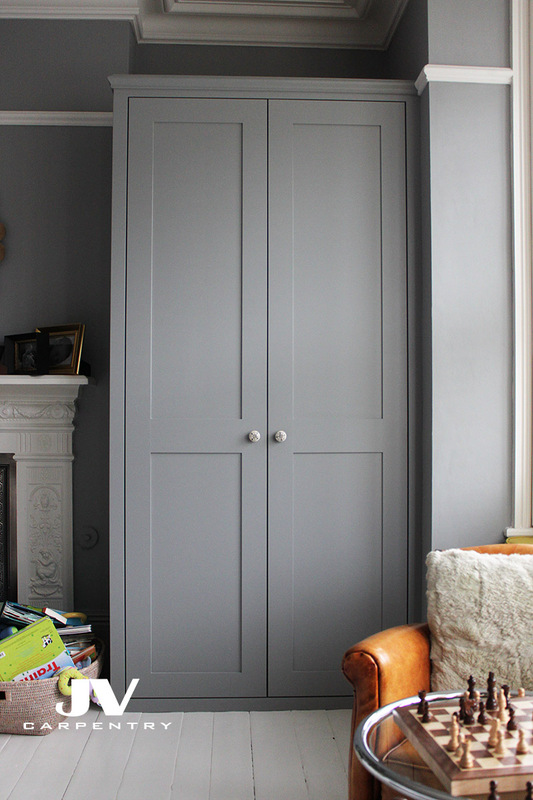 Now we have over a decade of experience in crafting our bespoke fitted furniture and that's mean we have built over 2000 of fitted wardrobes, cupboards and bookshelves for our customers around London. We have many customers who are returning to us because we always working hard to provide you with our friendly service and quality work. We have never spent a penny for advertising because we believe that the best advertising is the word of mouth and good reputation of trustful trader. At JV Carpentry we are all about creating customer relationships and we will assist you with design of your built-in furniture and can provide you with professional advice how to improve your space and look of your home. 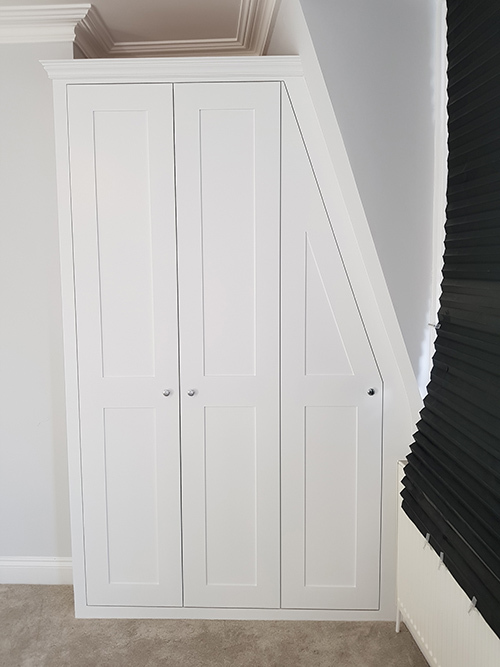 Whether you need a large fitted wardrobe, alcove bookshelves or a small fitted cupboard we will take every effort to protect your floor, cover your furniture and clean up after we have finished the job. 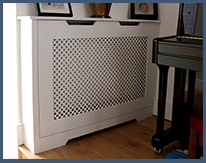 J&V carpentry can design and construct fitted furniture that can suit your needs directly. We take your bespoke specifications and ensure that we can create a functional product made to measure a specific space or to fit your design specifications. We cut every piece required for installation offsite in our workshop prior installation. This improves efficiency and reduces the total amount of mess/ disruption caused within your home. We specialize primarily in MDF construction projects but please keep in mind we do not often offer sliding door wardrobes or spray paint finishes. 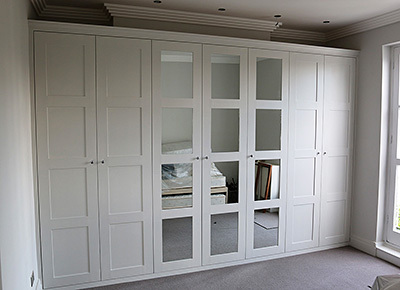 Our company makes fitted bedroom furniture such as wardrobes and cupboards in any style you may be interested in. Whether you have an idea for a traditional wardrobe or a very modern style, our fitted wardrobes can perfectly fit to your space and provide the utmost in functionality every day. We ensuring that all of your clothing will fit into the wardrobe and that you can make perfect use of every shelf. 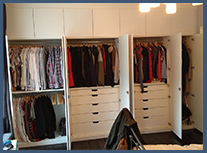 We purpose build our wardrobe doors and the cabinetry for your ideal storage needs. We can source and include some traditional details to your fitted wardrobe that can help you capture the Victorian style or make it flush and with clean-lines to match contemporary style. 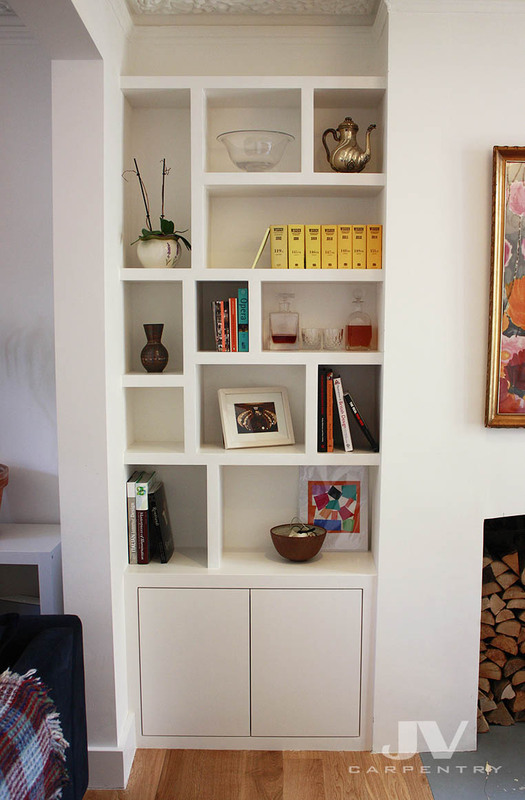 We make fitted bookshelves in almost any type of modern or traditional way. We can offer a standard size shelves or make changes to include thicker or floating style shelves based off of your specifications. 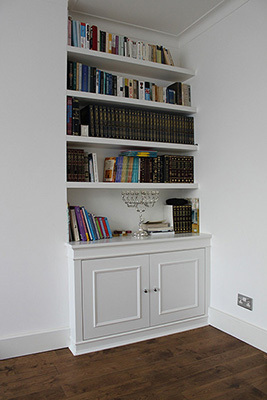 Our fitted bookcases can be integrated into almost any wall or we can build them around an alcove of your home. 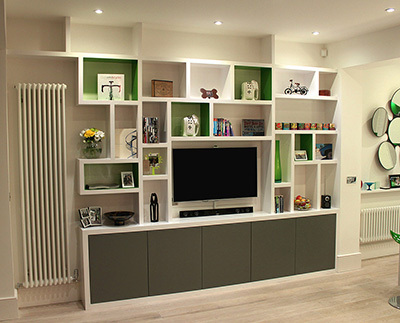 We will work with the shape of your room and install bookshelves and fitted cupboards to your specifications. Our fitted bookcases and shelving units can include cabinets at the bottom for storage behind the doors as well as adjustable shelves to help you make changes as necessary. Fixed shelving options can give you the chance to store your books or create a grand library on your property. 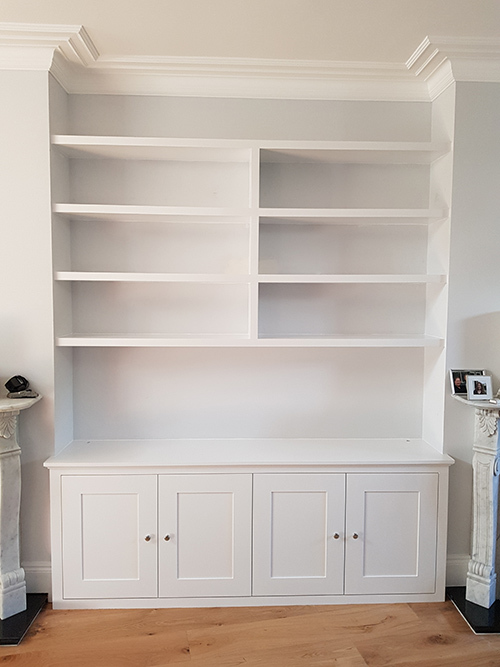 We can even make shelving and alcove cabinets which are perfect as a TV and entertainment unit or as a fitted cupboard for hiding away your DVDs, Blu-ray's or video games. 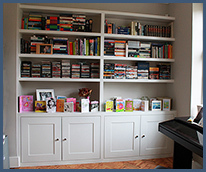 Improve your organization and reduce clutter with our custom made fitted bookcases. Many of our fitted wardrobe pieces, bookshelves and display units can include LED strip lights. As we are building the cupboards or shelving unit we integrate LED lighting during the installation to improve the light levels inside of any type of fitted wardrobe, cupboard or bookcase. Not only can this create a stylish effect for the furniture piece but it can highlight the clothing and help you have easier choices with your fitted wardrobe. We have a special hanging rail with a slot for LED strip and we can cut those rails to any size of your hanging compartment. We install a door switch that turns the light on automatically with the door opening. We can also cut a groove in the back of floating shelves to ensure that lighting strips can be installed inside the groove to backlight your books. LED lighting strips have become an extremely popular feature that our construction experts can include with almost any piece of bespoke furniture we construct. Please watch the time-lapse video how we install this large built-in library to get an idea of the installation process.